The Boston Marathon 2019 is over after hours were spent running the 26-mile course. Here’s what to know about the Boston marathon 2019 race. Let’s get the biggest news of the way first. Lawrence Cherono is the champion of this year’s race. Cherono was able to beat out Lelisa Desisa just before reaching the end of the course. This had Cherono completing that track in 2:07:59, which just beats out Desisa’s time of 2:08. It marked the closest victory for the race since 1988. That also put an end to Desisa’s hope of winning the race for the third year in a row. Coming in third during the race was Kenneth Kipkemoi with a time of 2:08.06. When it comes to the women’s portion of the race, it wasn’t even close. Worknesh Degefa ran past the finish line at 2:23:30 to take the first place spot in the Boston Marathon 2019 women’s race. Degefa was so far ahead of the other competitors during the race that they weren’t even in view of the cameras when she crossed the finish line. This was the woman’s first World Marathon Major victory, but not her first time doing well in a race. She was able to take second place during a recent marathon in Dubai. The Boston Marathon 2019 race was her’s, despite not having former experience with the course. This includes never giving it a practice run and it features hills that the runner also wasn’t used to. You can follow these links to learn more about the Boston marathon 2019. 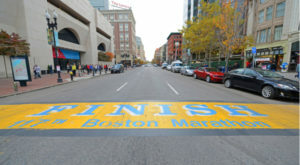 Article printed from InvestorPlace Media, https://investorplace.com/2019/04/boston-marathon-2019-highlights/.